CS5 and Lewisham…a troubled relationship. I remember when I first heard about The Cycle Super Highways, it seemed a great idea. Fast, safe routes for cyclists, from all around the city to Central London? Honestly? This was heady stuff. When had we ever heard anyone talk like this about cycling in London? The LCN, (London Cycle network) which had promised so much still remained piecemeal, patchy, and was never intended to give cyclists equal access to the mighty, main roads that power straight into our city’s centre. The proposed network of Cycle Superhighways seemed ambitious, brave and, finally, an indication that the authorities at last recognised the importance of cycling as a major strand of London’s transport network and were prepared to give it the space it was due. Well, that euphoria, if it ever really existed, didn’t last long. Even Boris’ biggest fans soon had to admit that, as the first dabs of blue paint began to appear and then promptly disappear for a few yards whenever a junction got a bit tricky, that this wasn’t quite what the initial publicity had seemed to promise. Lewisham Roundabout: Too dangerous for SuperHighway status. Too difficult to redesign? So, CS5 would now run from just inside the borough, linking New Cross, St John’s and the edge of Brockley to Central London. Well, actually, no it wouldn’t. And again, the planners realised what we already knew. The New Cross Gyratory is a particularly difficult piece of infrastructure to negotiate on a bike. Difficult to even work out where the blue paint might go, let alone ride a bike on it. 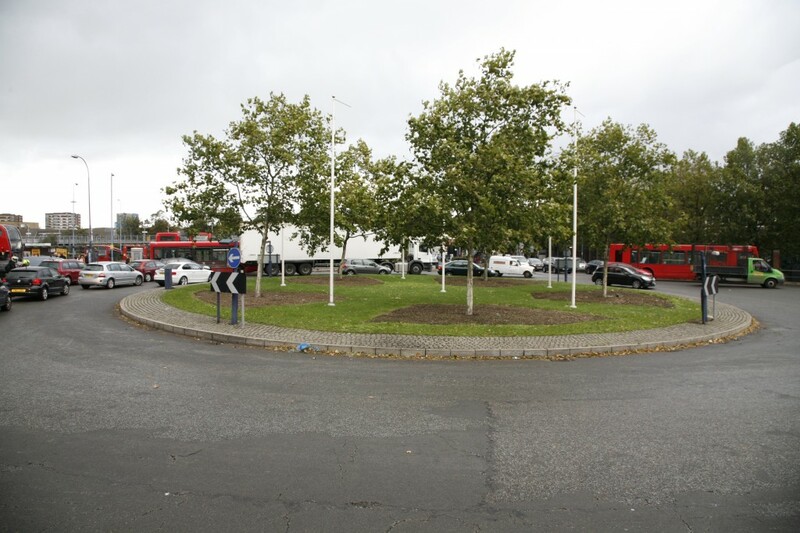 This, coupled with the increasing roll call of tragic cycling fatalities and serious injuries at major junctions and even on a super highway already in existence, led to this section of the route being ditched,as well, leaving merely a few yards of it in Lewisham now. But the super highway planners at TfL seem to remain in favour of creating some kind of route through New Cross at least. We have already been asked for our comments on a kind of mini or so called “lite” version, not using those main routes, but using quieter routes parallel to them, at least as far as Lewisham, where it could link to the Waterlink Way. And it looks like they want to begin planning for it in the New Year. Opinion amongst local cyclists that we have heard from so far is mixed. Some of us think that, if decent, safe infrastructure is on offer we ought to take it. Others think that we should move on, accept that TfL won’t deliver CS5 in Lewisham to an acceptable standard and demand that they use the budget to deliver infrastructure elsewhere in the borough where it’s needed. A fully segregated CS4 (Greenwich to London Bridge along Creek Rd and Evelyn St, with good, safe cycling links to the rest of Lewisham from that, is one example. TfL will be talking to us about it in the New Year, prior to producing anything for consultation. Which is, I guess, a small move in the right direction in itself. In past years, we would just have been shown the finished plans, if we were lucky. They are getting the idea that it’s actually useful to consult people who know what a safe cycle route should look and feel like before you plan and build it. So, if you have views, please tell us. The route which TfL are considering will have to somehow connect New Cross Gate with Lewisham without using the New Cross Gyratory. They have a few initial ideas, one using bits of route 2 through Deptford, then going up Brookmill Rd, to link with the Waterlink Way. If you think you have a better idea, you can leave a comment here, or email us on lewishamcyclists@gmail.com or even visit our Facebook group (icon link on our home page) and comment there. New pathway for cyclists and pedestrians alongside the eastern side of the railway cutting, running south from New Cross Gate station, linking up to St Donnats Road and Shardeloes road, Brockley Road, Adaleide Avenue, Ladywell and Lewisham High Street. Advantages: flat, quiet, creating new direct route to Brockley and Catford.